How can one person have such a long "to do" list? I usually grab a piece of scratch paper and scribble a quick "to do" list, adding & deleting regularly. When this paper has most of the things crossed off, I start a new list. Yesterday I realized that my list is getting more "wonky" every day! I decided to try a "to do" list on an Excel Spreadsheet. I started with categories like Home (balance checkbook, mail package to DD #1- email her to get her address this month), CHESS (that's where I teach math, so entries like grade papers), Micahels (where I teach crochet, check April schedule, create new class in Tunisian), Crochet (personal, CALs, contract work, new designs), and CGOA Chapter (we're offical! I need to schedule the library meeting room, plan meeting ideas, collect papers I want to share). Hope this helps the dis-organization a little. On the hooks, two Tunisian baby blankets, hope to finalize the pattern and get it ready to send out to a magazine. The second Tunisian piece for the contract, should be finished soon. A thread runner in cranberry. This is coming along nicely. I worked on this Tuesday at our Sit N Stitch at Michaels. I need to find some TLC Amore in white, Joanns and AC Moore both carry that yarn, but have been out of white for 2 weeks! I may have to drive to the West Shore (Harrisburg) and see what that AC Moore has in stock. I've been told it's a much bigger store. Or, I may have to resort to buying on line. I like buying on line, when I can get a bargain. I hate to pay more than I pay locally and then shipping on top of that. Sunday I finished the first contract piece, I took pictures yesterday. Wish I could post them, it's very pretty. That's about all I can say. Yesterday, I swatched some yarn to see what color I want for the next project. I took some pictures with the digital camera, uploaded them to the computer, and printed them to see if the stitch details would show up well in print. I gained a lot of information, but haven't made any final decisions. Tonight a few regulars got together at Borders for crocheting and chatting. I went next door to Michaels and looked more at yarns. I found a Simply Soft in Country Blue that I liked, so tried swatching. I like the color, softness,the fact that it has a little sheen, and stitch definition; but it's a thin worsted and seems a little "light" for what I've got in mind. I may go to A C Moore tomorrow to look at some new colors in Red Heart - dusty teal and light fuschia. On the computer moniter the colors look pretty nice, they print out well, but really need to see it in person. New on the hook, today I got an email that the shawl ministry had given out all the small white shawls for 6 baby baptisms lately, and there are 3 baptisms scheduled for April, they would like a few quickly. I had several skeins of TLC Amore in white, and played around with some knitting patterns that I wanted to switch to Tunisian. But TLC Amore is a super soft yarn, it doesn't have great stitch definition. It's best to use a very simple pattern. So, I'm working in Tunisian knit stitch, and working up a diagonal design. I'll need to think up a simple border. But it's working up super easy and fast! I have about 6 skeins of Homespun in white, will have to see how that will work up. I'm thinking it might be a little heavy for a spring baptism. Well, I've been run-down with a very bad cold for most of this week (or was it a sinus infection?) Sunday and Monday I spent on the couch, I skipped Shawl Ministry on Monday evening and our regular Sit N Stitch on Tuesday evening. Wednesday I called in sick to work, finally got slightly back together and tutored on Thursday. I didn't really get back to crocheting until maybe Wednesday evening. WIPs (Works in Progress) include a doily/runner for my sister, I've been working 1 or 2 rounds every evening; and a contract piece, working several rows every day, this is almost finished. I have an original Tunisian piece on the hook, it's on the back burner till I get some sales/contract pieces finished. I need to check with Michaels to see if they've scheduled me to teach any classes in April. And looking at my "dedicated crochet calender" I better start gathering things together for this month's CGOA meeting. We will start discussing plans for next February's Gathering of the Guilds. 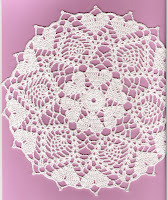 Here is the doily that I received from my exchange partner. Isn't it pretty! I enjoyed this exchange, I hope the group decides to continue the exchanges. 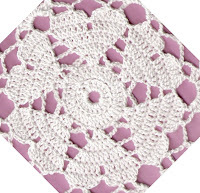 I'm getting ready to mail the doily for the exchange, and I don't remember getting a picture. 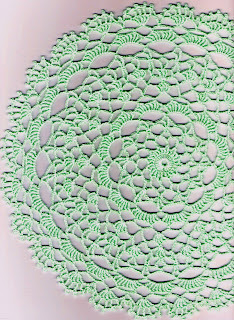 So, I put it on the scanner and put a piece of pink paper behind it to better show off the white doily. I scanned it, and then started playing with editing details. I think I've got some interesting pictures to post. I'm going to save this as a draft, and then post it after my partner has received her "puffie". This is a free Crochet-a-Long pattern from "Crochet Memories". You've read my positive reviews for this site before. I just love it! I wrote this entry about 2 weeks ago, and saved it as a draft. 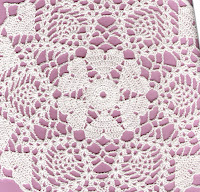 Now that my partner has received the doily I can post this entry with some pictures. I was sitting on the floor in #1 daughter's room, sorting patterns, books, misc papers and trying to get some things filed. It's the start of the "cleaning out both bedrooms, the girls will both be home at the same time". So, I've got folders and papers all around me and the phone rings, after answering & returning to sitting on the floor, the phone rings again. ARRRGGGH. I'm now taking a short break, making a cup of tea, and catching up on a few blogs that I haven't looked at recently. "The Crochet Dude" is making trips to IKEA and decorating his studio/office. I really like the bookcase, and baskets that fit into the bookcase cubbies. There's an idea if I get some space to turn into a work area for crochet and sewing. "Darla Fanton" is discussing colors, and mentions several books we might like to read, and has a link to a website about 2007 Fall colors. "Priscilla at by Hook or Needles" has another book to recommend and some basic color selecting information. I started a post on Tuesday evening with this exact same title. At the time, I was about 3/4 finished with the afghan which will be a wedding gift from one of my best customers. Well, my computer had a hissy-fit and shut down all my Internet windows without saving anything! I was a little more mature and did not have a responsive hissy-fit. But "I was not a happy camper". Last night I finished the afghan, thanks to a snow day here. I called work and said "Unless you desperately need me, I'm not on my way". So I spent the evening crocheting. This morning I took pictures of the afghan. Just realized that the next step should have been searching for the zippered blanket bags that I always put my afghans in, and the tags I attach that contain the washing instructions and a small amount of each color yarn that was used (in case future repairs are needed). It's now time to head out for a tutoring session, and I was going to deliver the afghan on the way home, but don't have it "tagged and bagged". Well, it's official - The Harrisburg Chapter of the CGOA is named Those (Y)arn Crocheters. Of course, we don't limit ourselves to yarn, we have some definite "threadies", but loved the play on word. If you're in the Harrisburg area in March, please check out our display at the East Shore Area Library. The project was last minute, I was contacted by the library on Tuesday, Feb 27th, asking if we'd like to do the display for March. Whoever had been lined up had backed out at the last minute. We decided that we'd love to do it, but couldn't possibly get something gathered up and put in by March 1st. We didn't do too bad, though, we had a display in before lunch on Friday the 2nd! The theme is Crochet: Past to Present. I started with a doily pattern that I worked up in a light worsted weight yarn as a baby christening blanket, the pattern was from the early 1900's and I got it from South Dakota University department of History and Culture. Then a doily from a 1916 book that is available from Antique Pattern Library, from there I went to a 1940's booklet on lace-making published in Paris, and some Barbie clothes from 1960's and 70's, an owl hanging made from granny squares - browns, orange (you know - definitely 1970's) and a 1970's book titled Decorating with Crochet, and a star ripple baby afghan. Then several hats designed by a member, which include a snowman, a peppermint, and eggs & bacon. Then a selection of books from the 1980's and 90's, and books and magazines from 2005-2006. I also has some samples of Filet, Tunisian, and Delta crochet, and made small cards with the names and a simple description. Hope you get the chance to see it if you're local or visit the area. I really enjoy belonging to a lot of online crochet groups. Along with talking about projects that they are working on, and posting pictures of the finished item, they always have useful tips, information about yarn & other fibers - how they work up, wash, hold up with wear, etc. and they always have links to great patterns, sales, and information. On Crochet Partners, a poster mentioned an online seminar from the Art of Crochet. Well, I missed the "real time" because I worked last night & I'm just getting to my email, but I went to the Art of Crochet website, and there are links. The seminar is titled "Gauge, Drape and Substitution". I just watched the first episode on gauge, and she has important information about gauge swatches. There are links to "crochet aids" which include a gauge tool and a worksheet for recording information about different fibers that you've swatched. I'm going to download these, even though I already have a small gauge tool, this is a nice 4 x 4 square which is the minimum recommendation for a gauge swatch. I already keep gauge information on different fibers I've worked, but here is a worksheet with all the information in one place, something I could put together, but haven't. Along with these tools, you're given information on the yarns used for the swatches, and several sound tooooo yummy. I'm going to try out some Debbie Bliss cotton/silk/microfiber blend. Doesn't that sound soft, and smooth flowing on a hook! Also mentioned is an alpaca/silk blend, that would be so soft. Must try a small amount of alpaca. I've been told repeatedly that there is no risk of allergic reaction, that alpaca doesn't have the allergens of wool. Will have to see, so far any animal fiber I've had on clothing I've regretted. Anyway, back to watch Episode 2 on Drape.